When you configure a bridged OpenVPN setup on a VMware ESXi (vSphere Hypervisor) you will notice that you can’t reach anything over the VPN except the OpenVPN host. This is because VMware by default prevents the NIC to go into promiscuous mode so the bridge won’t work. To fix this you need to change the VMware security policy to accept promiscuous mode. Go to ‘Configuration’ in the vSphere client. Select ‘Networking’ on the left. 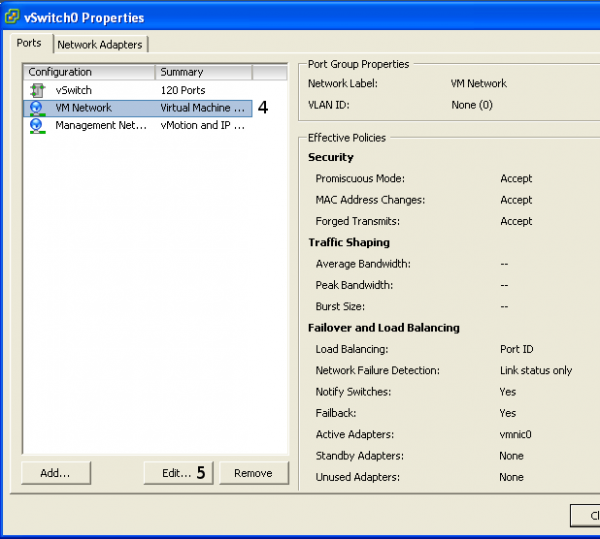 Select ‘VM Network’ on the ‘Ports’ tab. Go to the ‘Security’ tab. Select the check box for ‘Promiscuous Mode’ and select ‘Accept’.